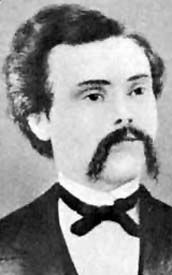 Alexander McSween (1843?-1878) – A lawyer in Lincoln County, New Mexico, McSween, along with partner, John Tunstall, opened a rival store in Lincoln, vying for the business that had been controlled by the Murphy & Dolan Mercantile and Banking. Alarmed by McSween and Tunstall’s plans, Murphy and Dolan attempted to put the pair out of business, harassing them legally, and when that did not work, Dolan tried to goad Tunstall into a gunfight. However, Tunstall refused to use violence himself, but soon recruited Billy the Kid Billy the Kid, and a half dozen other tough cowboys to protect him and his investments. In February, 1878, Tunstall was killed by the rival faction, igniting the Lincoln County War. On July 19, 1878, McSween and his supporters, including Billy the Kid, were besieged by their opponents in McSween’s house. His home was set on fire and several people were shot dead as they came out of the house, including an unarmed Alexander McSween.